On May 27, 2013 it was reported the rebel forces in Homs (FSA or other unsure) attacked a small Christian village, al-Duweir/Duvair (Arabic): الدوير, in the northwest fringe of Homs city. There was a massacre and a mass flight, with an unknown death toll perhaps no higher than 40, though initial reports said "Armed Rebels Massacre Entire Population." There has not been as much information as usual about this incident, but we have below a partial record to help understand. I arrived to the "truth" confirmed information about getting a major massacre last night in village "Doueir" Alchristahfa Homs, which was occupied by gangs of "victory" and "free" on the tenth of the month. The village is located on the course of the day Orontes and less than 2 km from the north-western suburbs of the city of Homs. FSA MASSACRES CHRISTIAN VILLAGERS AT DUWAINA; RETALIATION FOR STUNNING DEFEAT AT AL-QUSAYR; HUGE EXPLOSIONIN BARZA PUTS AN END TO FSA HOPES IN DAMASCUS;SAA ON THE MARCH EVERYWHERE; RAT-STATS ... 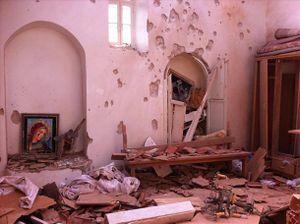 THERE HAS BEEN ANOTHER MASSACRE OF CHRISTIANS IN HOMS BY THE FSA. WE WILL HAVE DETAILS TOMORROW. IT'S JUST HORRIBLE. next day "AL-DUWAYR and AL-MUHAAJIREEN VILLAGES restored to normal and complete security after vicious FSA massacre of Christians at the former. It was by pure luck that SAA forces were around the area to prevent further killing of Christians by JOHN MC CAIN'S SAVAGES." Nothing further, it seems. Syrian army sources said that they reached the village after the massacre, resulting in clashes with militants. Sources also reported that Turkish and Chechen extremists were among the perpetrators. Chechen militants are known to have kidnapped two Christian bishops in Aleppo earlier this year. Al Duwair, northern rural Homs, 30-03-2013: The village of Al Duwair is under savage bombardment by regime tanks. Human Rights Watch has gathered new evidence of ongoing cluster bomb attacks by Syria’s air force and has confirmed them through interviews with victims, other residents and activists who filmed the cluster munitions, as well as analysis of 64 videos and also photos showing weapon remnants of 10 new cluster bomb strikes in or near the towns of Salkeen and Kfar Takharim in the Northern governorate of Idlib; Eastern al-Buwayda, Talbiseh, Rastan, and Qusayr in Homs governorate; al-Bab in Aleppo governorate; al-Duwair and al-Salheya in Deir al-Zor governorate; and Eastern Ghouta, near Damascus. 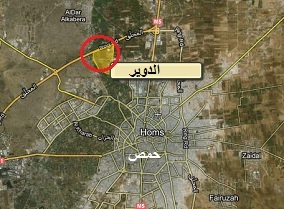 BREAKING: The Free Syrian Army has liberated the village of Al-Duwair in the suburbs of #Homs after heavy clashes there. There is also a Saint Elijah's Monastery near Mosul in Iraq, also called Dair Mar Elia or "دير مار إيليا" in Arabic. (Google search in Arabic) Great video here, with authentic helo sounds. This page was last edited on 18 May 2016, at 22:21.